* educational programmes and initiatives. 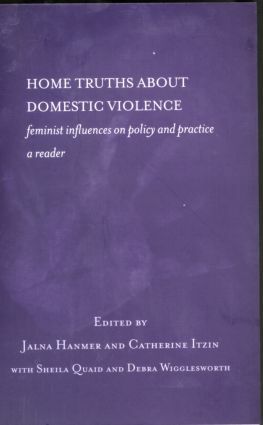 This substantial Reader makes a significant contribution to the understanding of domestic violence from both a policy and a practice perspective. Together with its companion volume Home Truths About Child Sexual Abuse it provides an in-depth resource for a wide range of teachers, students and professionals, highlighting the diverse and complex dimensions of the problem of domestic violence. Introduction. Women's Experiences of Violence from Known Men in the Home. The Experience of Children of Violence in the Home. Women Who Fight Back: Experiences and Outcomes. Influencing State Policies on Violence Against Women from Known Men. Partnership Approaches by Statutory and Voluntary Agencies. Decreasing the Violence of Men.